Digital marketing and the digital industry is moving at a faster pace today than ever before. Businesses we have spoken with keep telling us that their main issue is just keeping abreast of the changes, let along figuring out how to make the changes work for their business, that’s where we come in to help though. In 2014, the speed of change is only going to increase and from looking at the statistics, it is clear that digital marketing, social media and data are the key skills marketers are finding challenging. Below we will take a look through some of the key changes that are happening in the digital world and what this means for your business in 2014. We would love to hear your thoughts too, so leave a comment below. I’m sure you’re familiar with ‘The Cloud’ all of the benefits this is bringing to the world, we have seen a greater increase towards cloud based technologies in business for a number of reasons. This is not simply for traditional file sharing though, this is for your traditional software packages and for team collaboration too. Take a look at the Microsoft Office 365 product, and if you aren’t using this already then think about your standard Office suite that has been on an episode of ‘Pimp my Ride’. This may seem like a strange item to look at initially as you may be wondering what this has to do with digital marketing. Quite simply, the flexibility these types of product have along with the likes of Dropbox and project management tools allows your business to collaborate on projects in a much more efficient way than ever before. We are seeing trends with companies utilising staff around the globe to offer support for their customers around the clock, with cloud based technologies powering this transition. Within the younger generation particularly, and I do include myself within this bracket (no sniggering! ), more companies are utilising cloud technology to give staff the flexibility to work remotely while still being able to complete their job. Think of cloud printing, cloud based project management tools and cloud based file systems. The default 9 – 5 is eroding fast, with the work and home life blending together and people simply logging on to work on projects at times that are suitable for them. This has to be the biggest change we are going to see in 2014, an integrated approach to digital marketing will be key. We have started to see this last year with a few innovative companies, although a lot of companies are still working in silos when it comes to digital marketing. To succeed long term, quite simply, an integrated approach is essential. Let’s first look at your customers, these are the people who are going to be interacting with your business on multiple occasions throughout their purchasing journey. I do say ‘purchasing journey’ instead of ‘purchasing funnel’ as a funnel is too much of a narrow focus to be looking at in 2014. Customers don’t simply visit your website once, then purchase a product. The customer purchasing journey is far more complex as can be seen by this research by Google. 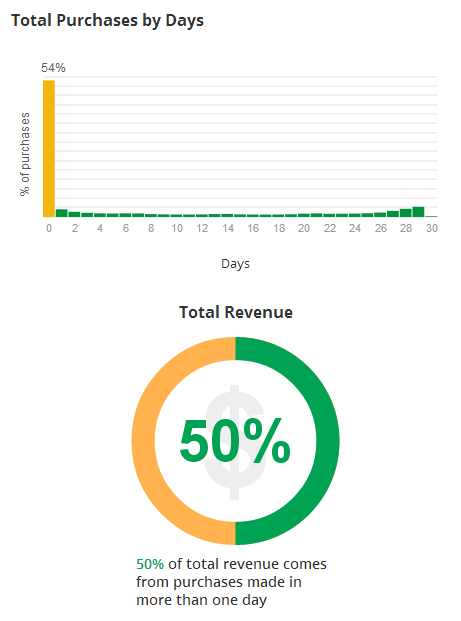 Looking at the data, around 50% of customers purchase after their initial visit. What this means is that 50% of your customers are going to be interacting with your business at another point on their journey prior to making a purchase. This is significant as those other interactions could be from search engine optimisation, pay per click advertising, email campaigns, display advertising, social media and from various devices such as a desktop computer, mobile phone or tablet. You have to ask yourself, when a customer interacts with you are they getting a positive or negative impression of your business, products or services? All of this is going to impact how many potential customers turn into real paying customers. An integrated approach from all areas within your business is essential for long term success, although one of the key issues that businesses face is different teams and departments working in silos and often towards competing KPIs. It is important to recognise when this is happening and take the necessary steps as a business owner to make the changes needed to allow a more collaborative approach throughout your organisation. Below are just a few examples of areas we have seen that needed improving in the past. Do you ever receive untargeted emails from companies you have purchased from in the past? If you have purchased a luxury Barbados holiday from a company in the last, then next week they are sending you offers about a holiday in Blackpool then this only reinforces to the customer that you don’t know what you are doing. The technology exists to allow you to link systems together and personalise your emails. Not only will this lead to a happier customer but this will also help increase revenue from email campaigns. As a business you will be working towards key goals both financially and strategically. Part of this process involves getting the right messages in front of the right audience for your business to fuel growth. If teams are working in silos then it often happens that one team is sending messages out in one area while another is sending out a different message elsewhere. A prime example of this last year was when Horsegate hit the headlines, with Tesco being at the forefront of the media. While handled well, there was a clear lack of communication somewhere along the way which led to a tweet being published stating “It’s sleepy time now so we’re off to his the hay” which wasn’t the best of times to tweet this out. The key focus for 2014 needs to be about getting the right messages out to your audience across all channels in a collaborative and integrated way. Expanding your social reach through the key assets within your business, your staff, allows you to connect with your audience and customers like never before. 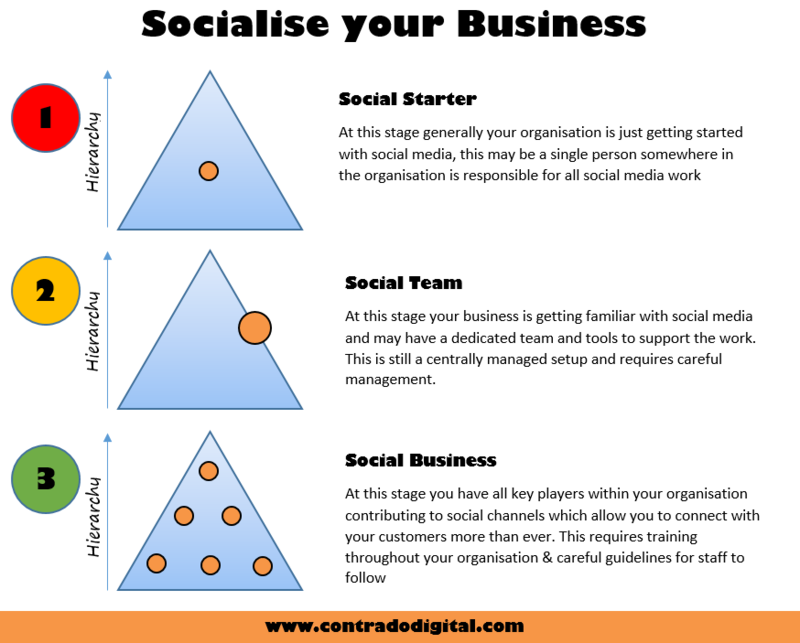 For most businesses they are at either the Social Starter or Social Team phase. Increasing your social reach as a business is going to be key to capturing the attention of your audience and engaging with them. An interesting theme that we are likely to see more of in 2014 is a pay-to-play model for social media. Facebook has openly admitted that businesses are likely to see a decrease in organic reach for business pages as their new algorithm rolls out. With Facebook pushing their advertising platform more, then this should come as no surprise, but what it does show is that businesses are going to need to adapt to this change. Within the Search Engine Optimisation area, there is always a focus towards building more links and is often a key focus for clients because this is what they have read is important. Businesses need to stop thinking about building links purely to increase their rankings on search engines. This is not a good long term approach, to the point whereby Google’s Head of Web Spam, Matt Cutts, recently wrote a blog post telling people to stop using guest blogging to generate links. 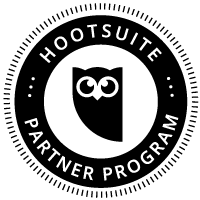 Instead what businesses need to be focusing on in 2014 is about real world partnerships with websites and other non-competing businesses whose audience is the same group of people you are targeting. This again comes back down to really understanding who your customers are and what makes them tick. If you know your audience is young hip women interested in travel, then maybe Pinterest is going to be a good focus for you. Only by understanding who your customers are will you be able to really target websites and communities to get involved with. If you don’t already have a responsive website, then quite simply you need to make this a number 1 priority for 2014. With around 28% of traffic coming from mobile and tablet devices you could be missing out on valuable sales by making it difficult for customers to purchase products on a mobile device. This again comes down to every experience and touch point having either a positive or negative impact on your brand. Brands that understand how potential customers are going to consume content differently are already leading the way with this change. Make sure you are one of the brands that isn’t falling behind and disappointing your potential customers. We have already mentioned the importance of focusing on the customer in 2014, and this is to really highlight the importance of this and how it can feed into your digital marketing strategy. Focusing on your customers allows you to understand exactly what they need and how you can help solve their problems. Simply ‘selling your products to anyone who is willing to buy’ approach isn’t going to cut it in 2014. Customers have more choice than ever to purchase from a competitor at the click of a few buttons, so show them you care and give them a reason to purchase with you. Firstly, do you know who your customers actually are? Often with large ecommerce websites businesses may not be clear who their customers are as they simply see it is another ‘product’ that has been purchased by someone. If this is you then the first step is to clearly understand your audience, only then can you begin to create a marketing plan that is going to target those customers and key demographic groups. Once you know who your customers are you can create relevant exciting and useful content for your audience. So instead of talking about your latest dresses in your catalogue, if most of your audience are men, then this may not be the best approach. The same applies for getting involved with your target audience on social channels and other online communities. If you don’t know who your audience is then how do you target them and engage with them? As mentioned earlier, the tools are available to personalise content for your audience, send them targeted emails and get them involved with your brand and community. When you have a true customer focus you naturally move away from thinking about keywords and specific keyword rankings as part of your search engine optimisation efforts and more towards content themes which links in with Google’s recent Hummingbird algorithm update. In a world where it is so easy for customers to let out their frustration online, this is an important point to take a look at your business and see where both products and services need to be improved. Simply looking to push more marketing budget towards a bad product or service is only going to lead to more issues to deal with from disgruntled customers. The same applies if your business doesn’t add much value compared with competitors. If everyone is selling the same items purchased from the same suppliers then where is the value added? To succeed online you need to be adding real value for your customers, above and beyond simply selling products. Particularly in the product industry, Amazon sells everything you can imagine, and they do it well. What they aren’t good at is providing useful and insightful information for users and this is where smaller brands can jump in and connect with their audience more. One key trend that is only going to grow in 2014 is in the area of technology and connectivity. A key phrase that is cropping up at the minute is the ‘Internet of Things’ which is a geeky way of saying that every electronic device will be connected to the internet. This is exciting for digital marketing because this gives us a lot more data and technology to experiment with to enhance the customer journey. Look at some of the latest wearable technology including the Samsung Galaxy Gear, Google Glass and Google Contact Lens – all designed to allow people to interact with the digital world in a more sophisticated way. The Samsung Galaxy S4 has Near Field Communication built into the device which again increases the options available for marketers to utilise in campaigns. Watch this space in 2014 as new and innovative ideas are launched for large brands around the world. We wouldn’t be talking about technology and connectivity without mentioning Google’s latest acquisition of Nest, a Smart Thermostat for your home. Not to go too futuristic, but have you seen the films Iron Man? Imagine how Nest could quite easily be upgraded with a microphone to allow you to say “OK Google: What time is it”, in a similar way you can already do on your smart phone. 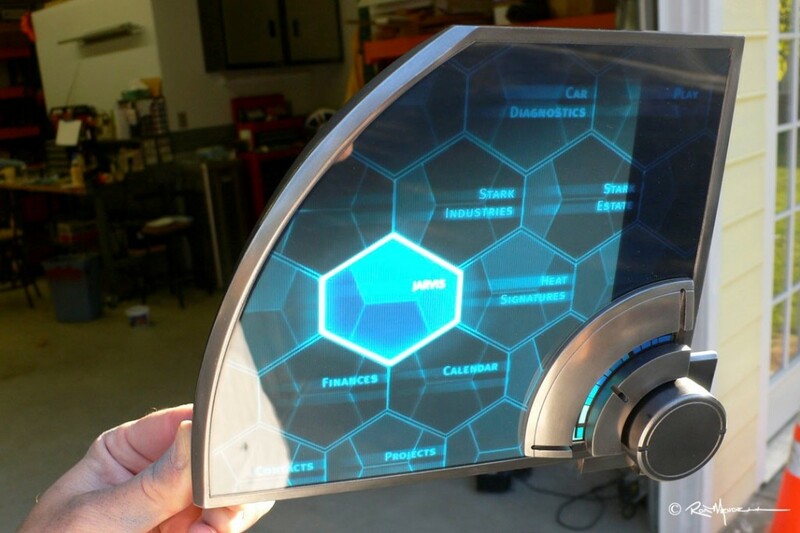 This really isn’t fantasy, but is something that brands need to start thinking about how people are going to be interacting with their brand differently in the years ahead through significant advances in technology and connected devices. Another key focus following on from this is the rise of Smart TVs in the market place. If you aren’t aware already, a Smart TV is basically one that is powered through the internet, opposed to your traditional aerial. This is an exciting change as we mentioned about responsive design earlier, well what about responsive design for Smart TVs? 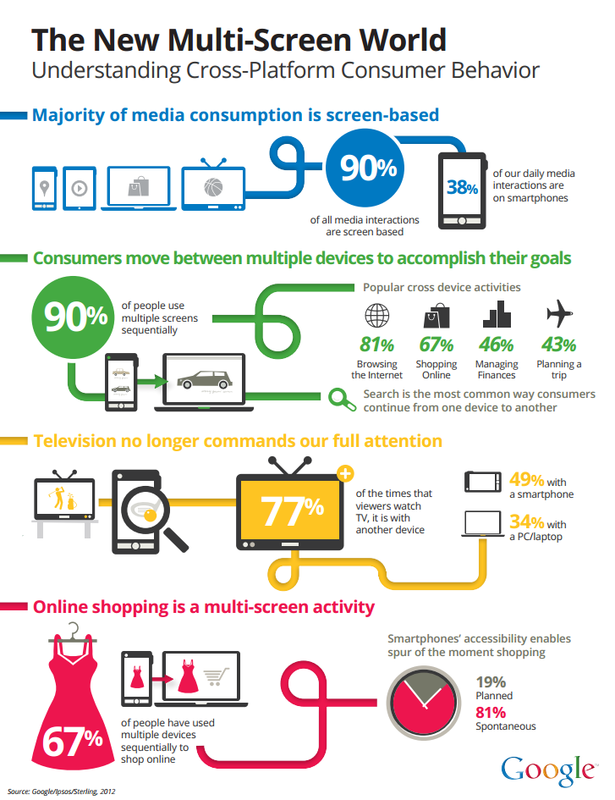 2014 is going to be an interesting time to see how customers use Smart TVs in comparison to desktop computers and mobile devices when browsing the web. The amount of data that is available about your customers from different systems is huge, analysing this data allows your business to make informed decisions to help your business grow. 2013 was titled as the year where ‘big data’ would become common use, although the reality was quite different. As businesses begin to use more tools and continue to expand their digital presence, we are going to see more businesses using available data to gain valuable insights into their customers. We will start to move away from the traditional ‘last click attribution’ model and more towards looking at cost per acquisition figures, customer lifetime value figures and understanding the whole customer journey better. Likewise we won’t see a high bounce rate as a bad thing, instead we will star to understand that actually the customer simply had to go to work, then picked up their journey again at their lunch hour, then went home later in the eventing to discuss with their partner before making a purchase. This type of data exists and can provide real value to businesses to market to customers at every step along the way. Well that is quite a lot of things to look forward to in 2014 and these are just a few of our thoughts. What we can be certain of is how 2014 going to move faster than ever before and businesses are going to need to really step up a level when it comes to their digital marketing activities. In such an ever changing environment with competition only a couple of clicks away, it is essential to engage with your audience and connect with your customers more than ever before across all channels. Great comprehensive list Michael. Part of my remit from a business client is to help make introductions for guest posts, but we only concentrate or look for high quality websites, do you think this will ultimately be penalised? It’s all unique content written to a high standard and never just one piece, we aim to offer content several times over the year. Thanks Dennis, glad you found it useful. The short answer would be, it depends. The reason it depends is how you classify a ‘high quality website’. Is this being categorised purely from an SEO point, or a website with a high Page Rank, or a website with a high number of backlinks, or a genuinely authoritative website within the specific niche? My advice for clients has always been to think about targeting websites and businesses that you would naturally contact if SEO didn’t exist. So a website that is going to drive referral traffic to their website, a website that has a high readership for their target audience. If this is the case, then I wouldn’t be worried about guest posts at all as this is something that is adding value to the website where the guest content is being placed and is also building the clients brand online. This is certainly an area to keep a close eye on though as Google’s algorithms aren’t always perfect and can classify guest posts in the wrong group. As with everything, guest posts should be used in moderation and as part of a wider digital marketing strategy covering SEO, PPC, Content Marketing that are all in-line with the business goals.